Located in Alfragide, Edifício do Conhecimento is the new base of Nokia in Portugal. With an interior design project by Openbook, this office stands out for its versatility, functionality and comfort, effectively accommodating all Nokia teams. Through striking architectural elements and an appealing color palette, the 6-story office is a reference project in Lisbon. Vector Mais has developed all the construction work, engineering, carpentry, furniture (meeting rooms and common areas) and lighting supply. “Our creative process was based on Nokia's design guidelines: Pure, Alive and Principled. We developed a ‘Brandchitecture’ concept with the theme of a technological ‘net’ that intends to represent the technology and disruptive innovation of the company to connect the world and we introduce an architectural language that translates into dynamic lines that contaminate the interior space (ceiling, walls and floors). This ‘net’ maintains a conceptual link between the various floors stimulating the collaborative work of the company's employees thus providing a new human experience.” Paulo Jervell, architect, Openbook. “We are very pleased with the result delivered by Vector Mais for this very challenging project in time and scope. 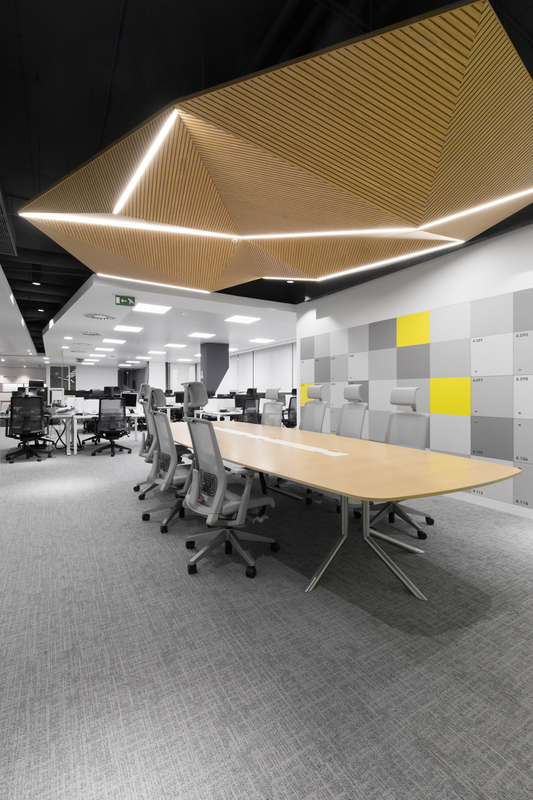 I can confidently recommend Vector Mais for developing office fit-out works, whether on a Design and Build solution or just for execution since their team of professionals and partners work tirelessly to exceed our client’s expectations.” Patrícia Tomé, Source 8, project manager for Nokia.